Rava Idli is an alternative to traditional Rice and Dal idli. It is a very popular simple and easy to prepare South Indian breakfast dish. Rava idlis are made by steaming batter in Idli mold tray which is made by mixing Rava (sooji, Cream of wheat) and yogurt. These Idli’s are soft fluffy and white they taste delicious with Sambhar and coconut chutney. Unlike the traditional Rice and dal Idli Rava idli is quick to make dish since it does not require soaking, grinding and fermenting the batter. Rava Idli is steamed with no oil and no spices it is an ideal dish for everyone. 3. Pour the yogurt over the Cream of wheat (sooji) and mix it well. 4. In the batter add water little at a time and mix it. 5. The mixture should have a thick consistency. 1. Once batter is fermented and you are ready to make idli, add salt and mix. At this point if batter becomes thick as sooji absorbs the water, you can add a little water. The Consistency of the batter should be thick. 2. In a large pot or Idli cooker add about 1” of water and bring it to boil. 3. Grease the Idli trays with a drop of oil and rub it around. the top leave some room for them to expand. Stack the idli trays in the stand. be on the top of each other. water and close the lid of the cooker or cover the pot. start coming let the Idli's steam for 10 to 12 minutes. see if they are cooked, if the tooth pick comes out clean it means Idli is cooked. Take the Idli stand out of the Idli cooker or the pot. until you take all the Idli's out. This way you will have smooth topped idli's. Do not take out when the Idli's are hot as it will not come out properly. 11. Clean the Idli maker and grease it before you make more idlis. 12. Serve the idlis with sambhar and coconut chutney. thick it requires more water if yogurt is watery then it require less water. 3. The Idli batter has to be fermented otherwise you won’t get good Idli's. you would not have savor taste. 6. If you want to prepare Idli's in batches then prepare batter without adding ENO salt and divide it into two equal portions. 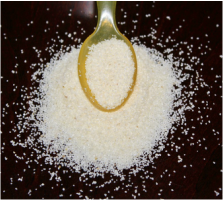 Add ENO salt in one portion and mix and pour immediately into greased Idli mold trays and steam. When first batch is steamed add ENO salt in the other portion and follow the same process.